Newton's law of cooling states that the rate of heat exchange between an object and its surroundings is proportional to the difference in temperature between the object and the surroundings. Simply, a glass of hot water will cool down faster in a cold room than in a hot room. Whether it is the manufacturing of automotive parts, a food processing unit, the medical or pharmaceutical industry, there is an engineering process involved. Process cooling is the term where by a constant fluid temperature and flow can be maintained regardless of the load. The integrated chiller design includes a pump and reservoir or storage tank. Process chillers (Water chiller)- Process chillers are made to operate at different temperatures with different fluids and different flow rates. Air conditioning chillers- Air conditioning chillers are made to run at one temperature, one flow rate and one fluid type. Evaporative condensed chillers- Evaporative Condensed chillers operate in a manner wherein a condenser is integrated into a cooling tower which rejects the latent heat of condensation of refrigerant through a coil to the surroundings by means of evaporation. This process contains a Cooling Tower, Storage Tank (Beltecno’s SS Panel Tank) and Water circulation pumps. Industries that can be served- Automotive, Aerospace, Forging Industries, Pharmaceuticals and other manufacturing industries. Process in brief – In most of the industrial processes, water is being used, typically, to cool down the system or to remove the heat generated during manufacturing operations. 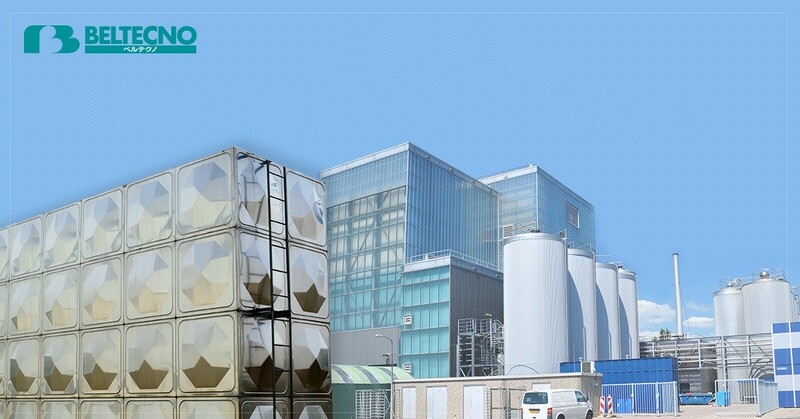 In process cooling, a certain water temperature needs to be maintained and this can be achieved by implementing the closed circuit cooling like a cooling tower or chilled water systems. In the above picture a cooling tower is being used for machine cooling and it can be seen that the remaining two major components of process cooling are the Storage Tank (Beltecno’s SS Panel Tank) and the Circulation pumps. 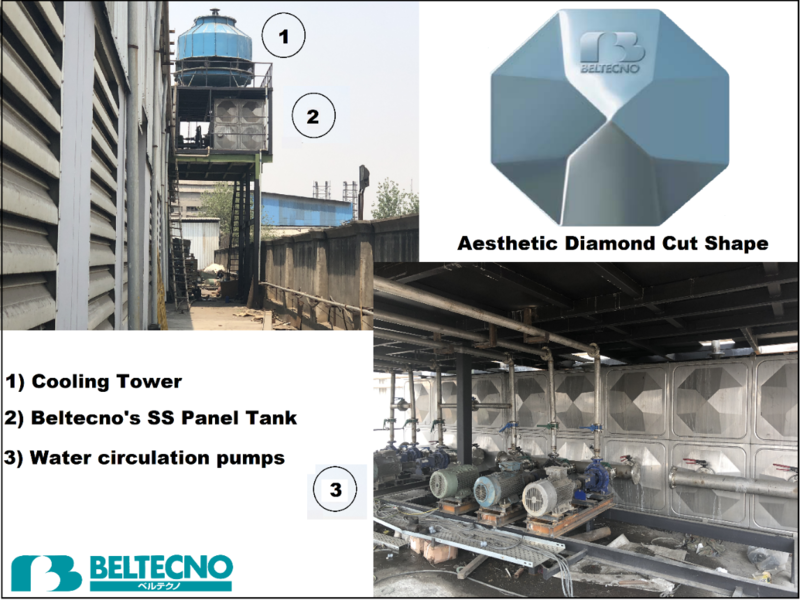 SS panel tanks are widely used as a reservoir in process cooling and here are ten main reasons to choose Beltecno’s stainless steel panel tanks. High strength due its Aesthetic design. Easy to install due to in-house manufacturing and factory assembled.